Blessed date night rolled around again. We made some tasty ravioli, and by that I mean Brian made some tasty ravioli. It was not like some frozen ravioli that come filled with four bland cheeses and no spices. The brand was Buitoni, if you're in the market. The evening was calling us outdoors because it's cooler than it's been. We planned to take a walk and what better way to walk than while eating ice cream? We'd use our Pogo card at Goodrich and get two cones for the price of one. So there we were, happily sampling flavors, when the lady spied our Pogo and let us know it was expired. After a moment of panic, when I wondered how rude it would be to abandon ship while still holding my sample spoon, Brian suggested we split a cone. Of course! He's a genius. The total was still 2.57. 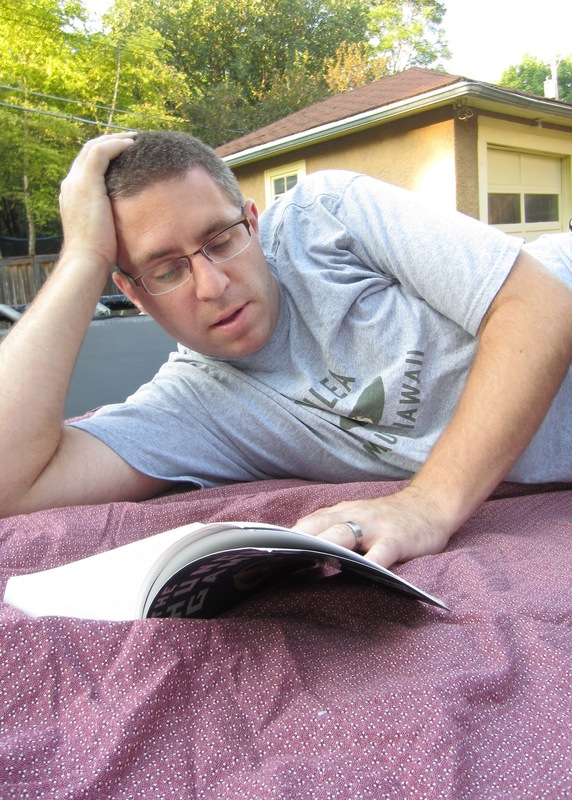 Back home, Brian read to me on a blanket on the trampoline. We stayed out til it got hard to read. I feel more anticipation of our dates now than I did when we had money to go do things. Maybe because we're in it together, getting creative together and liking what we find.